While most dermatologists and doctors preach the benefits of drinking more water, water gets boring. Perhaps you’ve done just about everything to make your plain glass of water more enjoyable. If you’re running out of ideas and are tempted to reach for a caffeinated beverage you’re not alone. 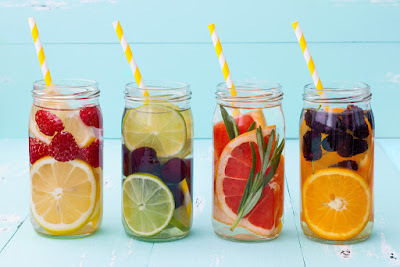 We talked to the experts who gave us six fresh infused water recipes that’ll pack a punch of flavor and add health and beauty benefits to your H2O! If you’re new to infused water it’s easy. Chop up the ingredients, let them sit overnight in your water pitcher and sip your way to healthy hydration inside and out. This combo might seem weird, but adding the health benefits of ginger and the antioxidant power of mangoes is a surprisingly tasty mix! “Mangoes contain so many vitamins that help boost your immune system. It has antioxidants that maintain youthful glowing skin and aid in the production of blood cells,” says Dr. Christopher Calapai D.O. an anti-aging expert and long-time health advisor to the New York Rangers hockey team. “Ginger is also helpful in fighting infection, has been linked to lower cholesterol levels, may reduce muscle aches, and helps digestion,” adds Dr. Calapai. “Rosemary improves circulation and sends more blood to the brain which is linked to greater concentration and potentially reduces risk of Alzheimer’s,” says Dr. Calapai. Grapefruit is not only delicious but it’s a natural fat burner, boosts metabolism and cleanses your liver. “This melon variety tastes great and is amazing for your skin,” says Dr. Kally Papantoniou board certified dermatologist and clinical instructor at Mt. Sinai Hospital in New York. “Melons are immensely hydrating, meaning more hydration per cup of water. Pick your favorite citrus fruits, cut up into slices and add some crushed mint. “Adding mint to your water is not only extra refreshing but also improves digestive health and can speed up your metabolism,” says Dr. Calapai. “Mint actually contains salicylic acid, a potent acne fighter,” says Dr. Papantoniou. “It’s also well known for it’s anti-inflammatory properties which work to calm irritation both on your skin or internally,” she adds. “The reason so many spas use cucumber based treatments is because it contains many skin friendly minerals like magnesium, potassium and silicon,” says Dr. Papantoniou. “This mix is especially healthy,” says Dr. Calapai “Cucumbers are powerful detoxifiers, flushing out any waste in your system. Adding crushed lavender to the mix not only adds a beautiful aroma but can also help digestion as lavender contains polyphenols that reduce bad bacteria in your gut, making your system run smoother,” he explains. Get your favorite store bought raw coconut water and refrigerate overnight with large chunks of pineapple. The coconut-pineapple flavor combo is delicious and reminiscent of a piña colada without all the sugar and calories. Although this is not pure H2O, coconut water contains electrolytes which plain water does not, which rehydrate you in record time. There are great benefits to keeping hydrated. Water does not have to be boring, it can be delicious. Drink up!